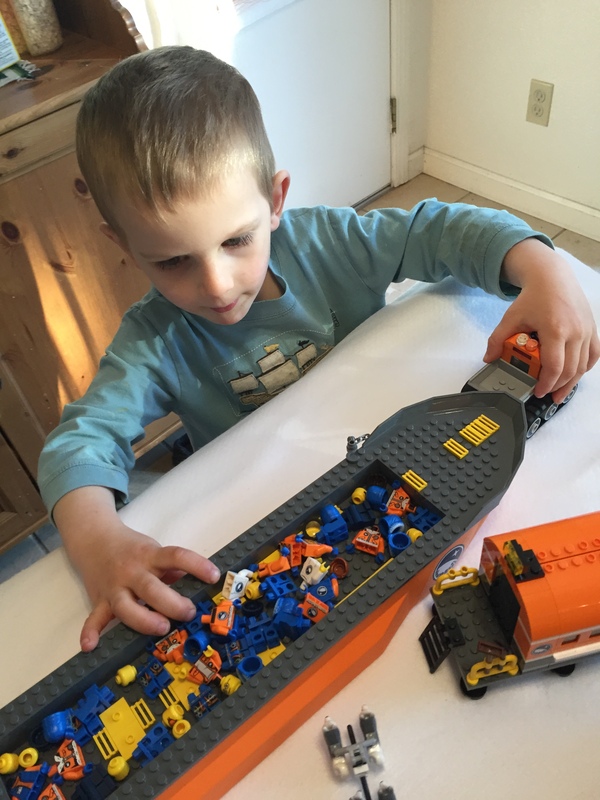 The other day my ever-helpful three year old decapitated a boat full of Lego minifigs from our collection of Lego City Arctic sets. Once the helpful little fellow was put to bed, I started reassembling the crew. A few minifigs into the process I noticed there were some female minifig heads in the mix. You can tell they’re women, because they have pink lips, the slightest hint of eyelashes and no facial hair. My husband tried to argue that there were a few gender-neutral ones — no facial hair, eyelashes, or lips — but really, we all know those are guys. 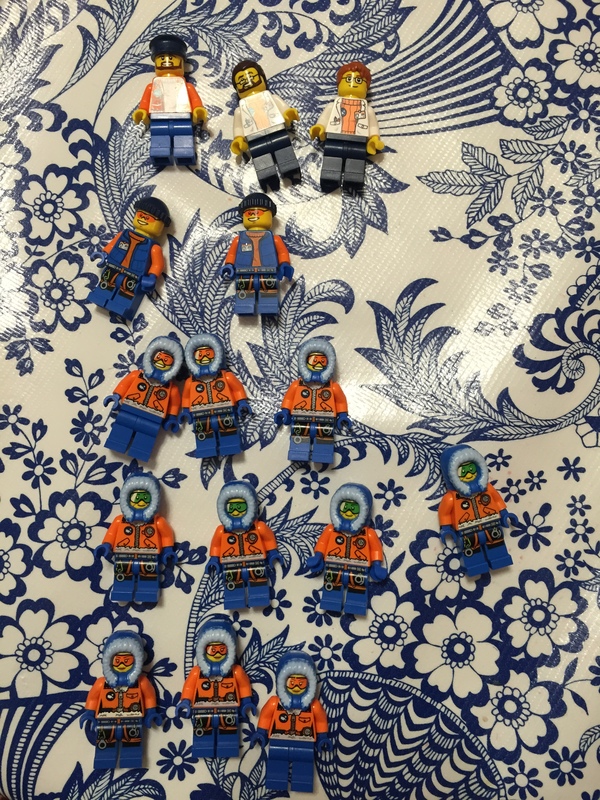 After I was finished, there were three female minifigs, in full arctic gear, they looked nearly identical to the others, except they had waists accentuated by a bit of paint. I understand they’re in the Arctic and that you have to wear a massive hood, but I feel they should’ve tried to make the women stand out a little more. The three in the bottom row are women, you can tell by their paint waist contours — now that I look again, I’m not sure if I matched the correct pants to the correct bodies, but seeing as the helpful little fellow has taken them all apart again, I’m not going to stress too much over it. Not one of the women was dressed as a scientist, helicopter pilot or ships captain, nor were any of those torsos painted with contours to imply a female form. 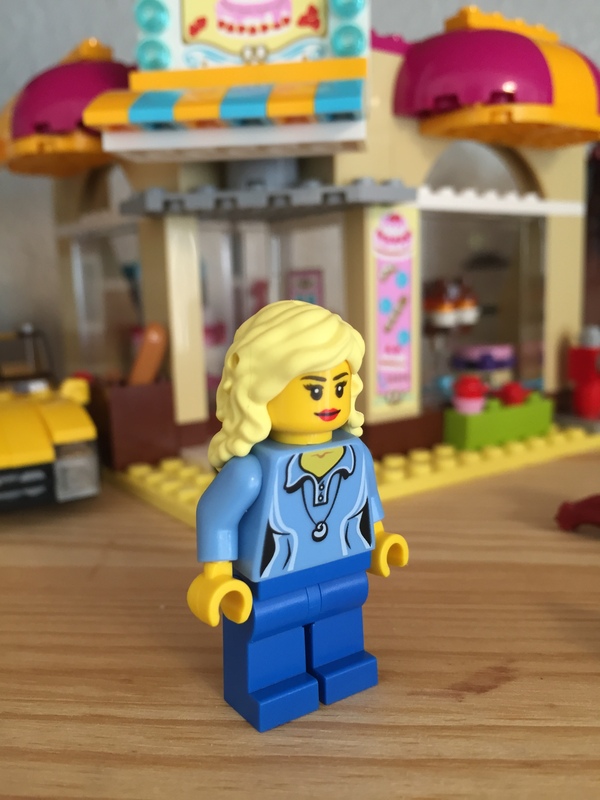 Sure, I could raid my minifig bin and find a womanly head with lips and ponytail to stick on the scientist — and I will probably do that at some point, but really is it really that hard to do it from the start? 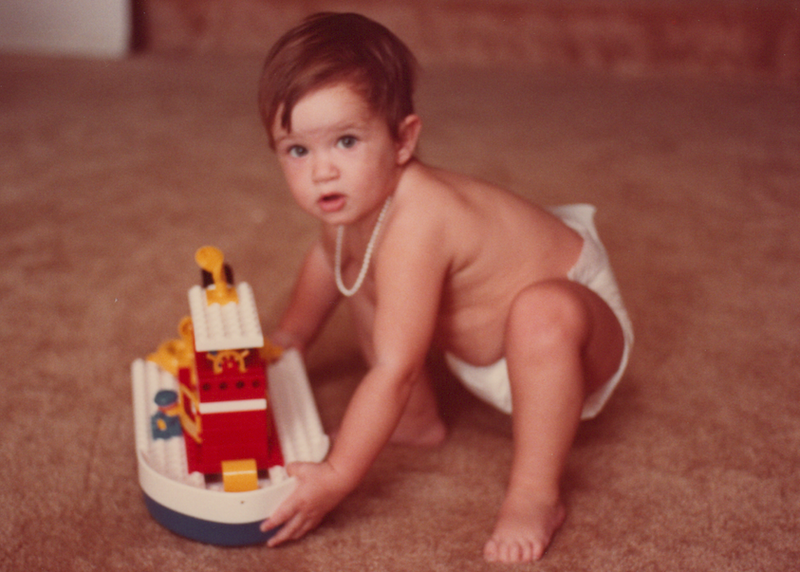 Me in the 1980s playing with Duplos, I’ve been at this for a long time now and we still have that boat. I don’t think the Lego City Arctic line is a “gendered” toy, I would’ve loved to play with it as a little girl, even with the lack of obviously female minifigs — a hair-swap from the minifg stash could fix that, and really, a painted-on hourglass figure isn’t all that important. The waist is a nice touch, but it didn’t matter all that much to me back in the late 1980s-1990s at the height of my adolescent Lego playing. Most of the Lego torsos are pretty gender-neutral, so I don’t mind too much either way. 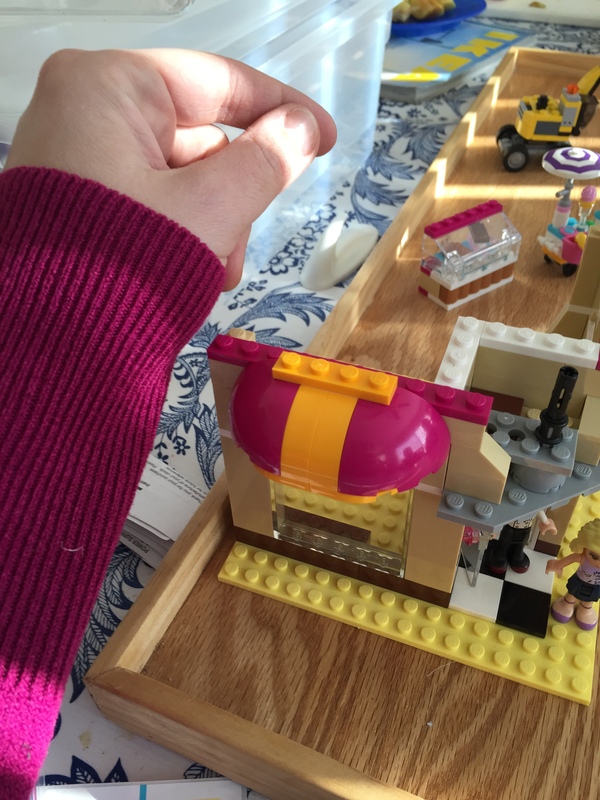 I’ve been playing with Legos since the 1980s, and I had my share of Lego System — the precursor to Lego City, pirates, knights and even some of the Paradisa line (Lego’s 90s attempt at girl-oriented sets). 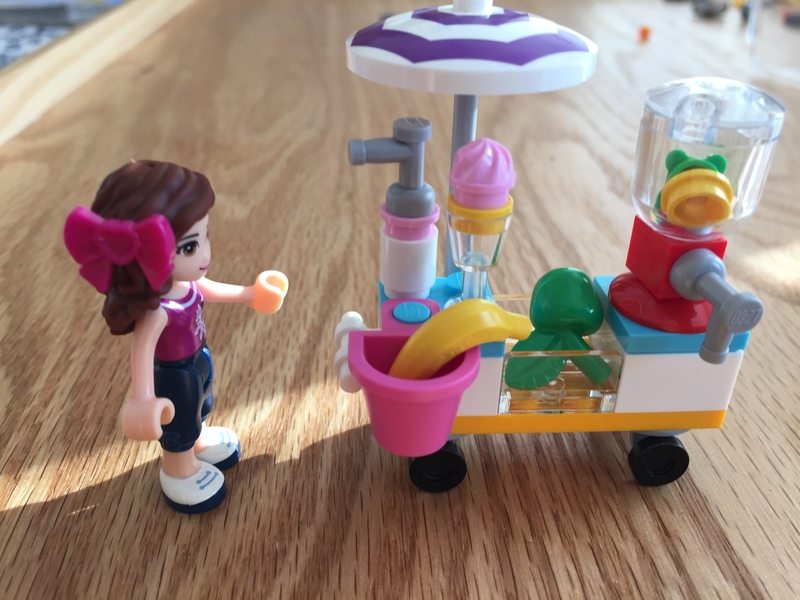 It isn’t that hard to make a toy appeal to girls — the recent comic addressing Lego Friends that went viral neatly sums up the issue: add more ponytails. 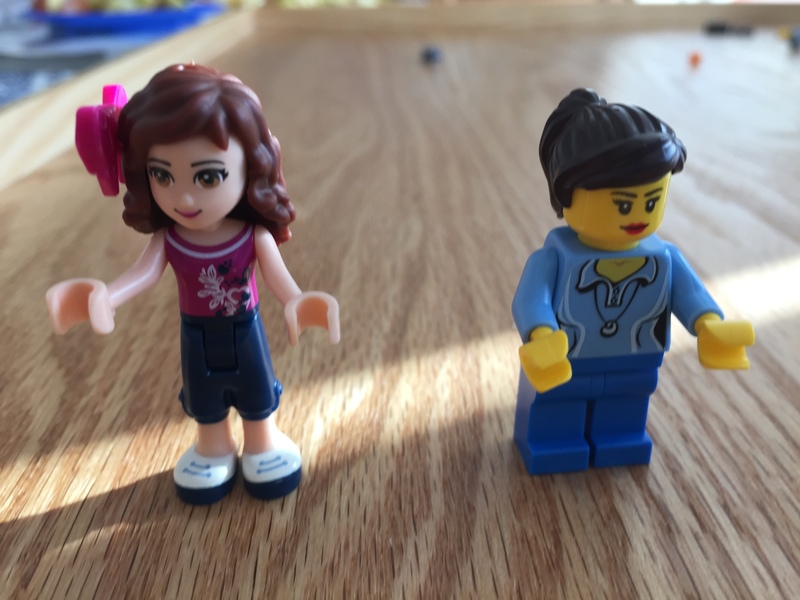 Ten-year-old-me didn’t mind the lack of women — and there were “Lego System” sets targeted a girls beyond the Paradisa line (which had regular minifigs that were compatible with everything else) — but me-in-my-30s thinks there should be a bit more representation. Lego has gotten a lot of criticism for their unveiling of the Lego Friends so I decided to pick up a set to see what all the fuss was about. I know I’m not the target audience for Friends, I’m in my early 30s and I’m the mother of boys. We scored the Downtown Bakery on post-Christmas clearance at Target, as well as one of the cellophane bags — I think it is a juice cart? We started with the juice cart. 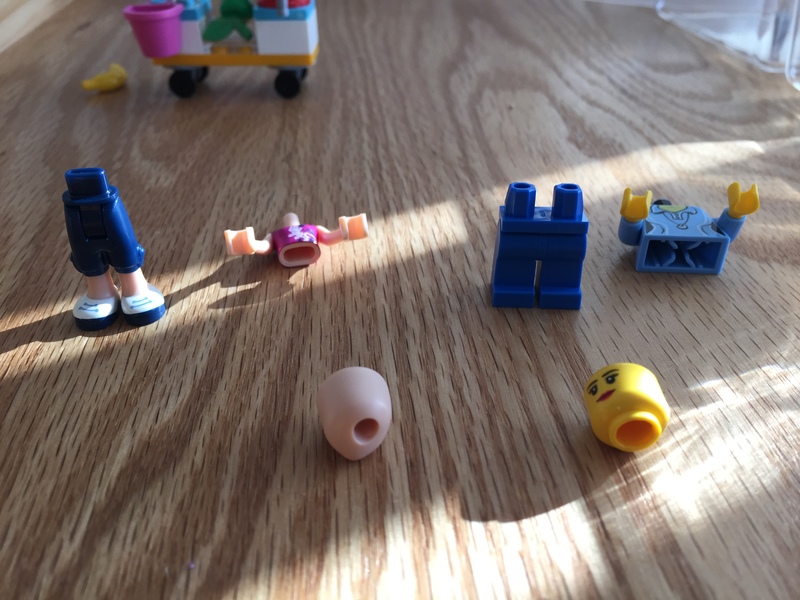 The boys had a lot of questions, the older one asked why is the minifig shaped differently? The little one asked why I didn’t stick both bows in her hair. The build was cute, the result was a fun little cart — I found the bright yellow a little off putting, but I’m not really their target market. The biggest issue I had was that the Friend-fig couldn’t rotate her hands to grasp and push the cart. It was a little frustrating, one of the things I like about the regular minifigs is that their hands are somewhat pose-able — and you can take them off to give them hooks (for pirates), grey gloves in winter, or white gloves (for Santa). The friend-fig was also noticeably taller than the regular minifig. Friend-fig had a more stylized face, small waist, and hole in her hair for a bow. Friend-fig and minifig can’t shareclothes, but they can swap hair with really cute results. I’m not sure if all the regular women’s minifig hair comes in such styles — I haven’t really purchased new legos since the mid-1990s with the exception of some bionicles in college, but the Friends hair is adorable, and it comes in more colors and styles than it did back in the 1990s — the women of the Paradisa minifigs came with brown, black or bright red ponytails. I noticed Friend-hair is rubberier than regular mini-fig hair, and you can add bows. I don’t really care about the bows. They can share hair and nothing else. The non-compatibility of the bodies is a bit irksome. 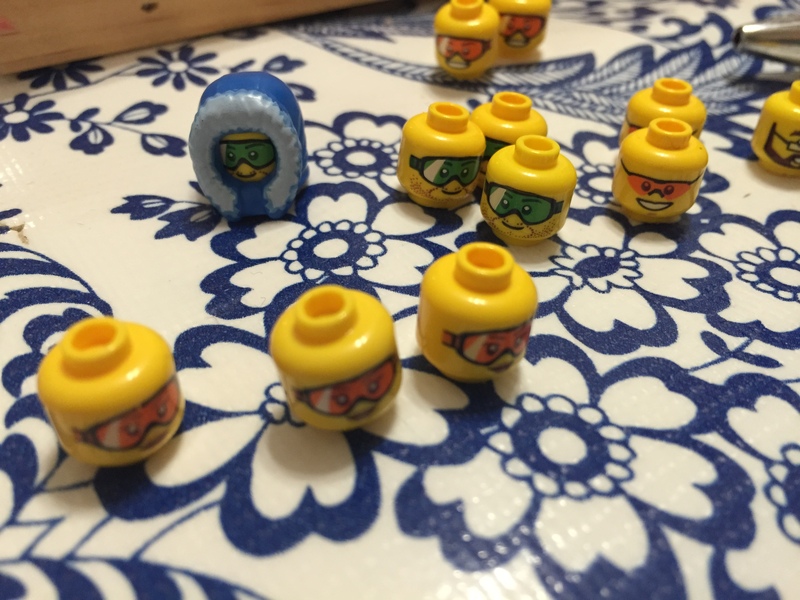 The friend-figs don’t integrate with the rest of the minifig family. So, on to the Downtown Bakery. The first thing that really stands out to me is the very vibrant colors. 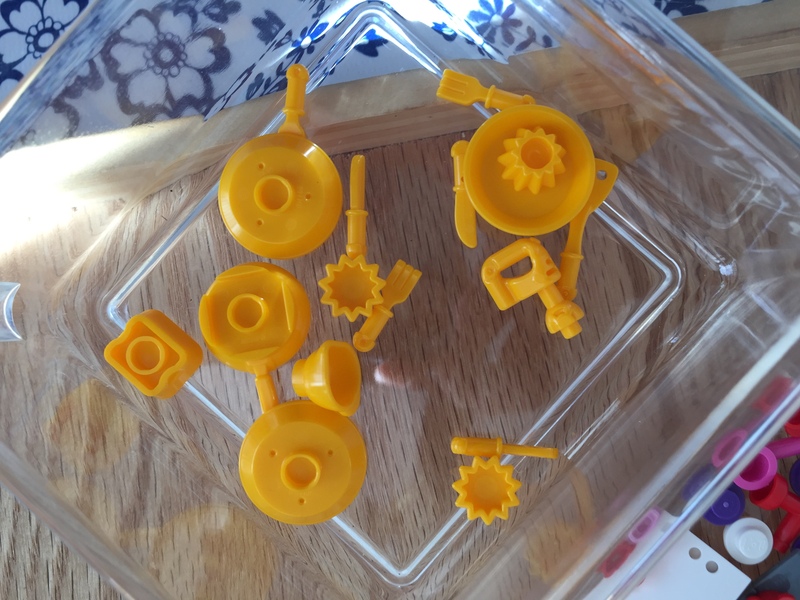 The base plate is baby-duck yellow, and the accessories are a brilliant goldenrod. I know Lego makes frying pans and other accessories, knives etc. in other colors, like black and grey. Why it has to be goldenrod is beyond me. My grandmother would love it, but her guest bathroom is done in this color — hello 1970s. Again, I haven’t regularly purchased Legos since the mid-90s (although we’re starting up again), but I don’t recall the minifigs of the Paradisa line having names, much less back stories. Yes, I named my minifigs and gave them back stories, they weren’t pre-ordained by a marketing department. 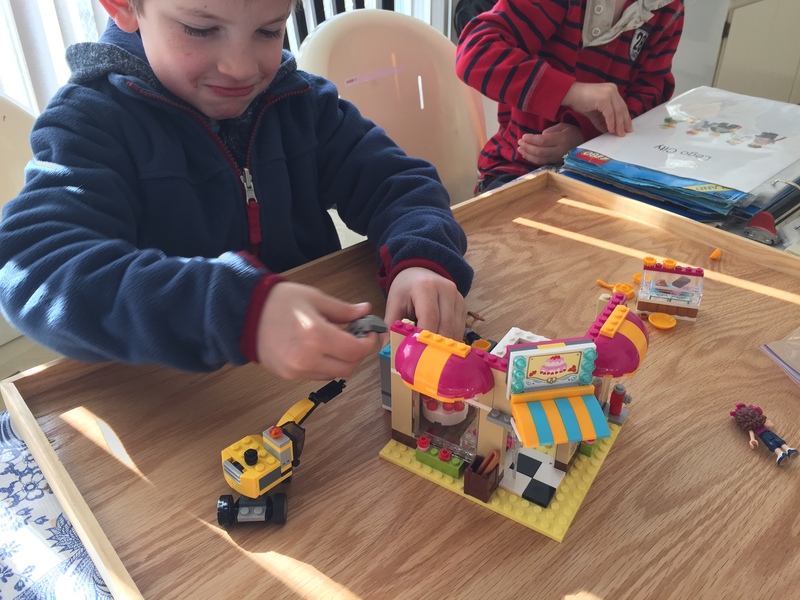 One of the reasons I like Lego so much is the endless opportunities for open-ended creative play, and this puts a damper on it, I plan to ignore the back story, and let the boys do what they want with the bakery. They don’t need to know the Friend-figs are named Mia and Danielle, or they’re making a wild-berry birthday cake, by the end of the build they were busy using the crane to drag it around the building board. Strange Friend-figs and very bold colors aside, I love the bakery it looks like a possibly real-world bakery. 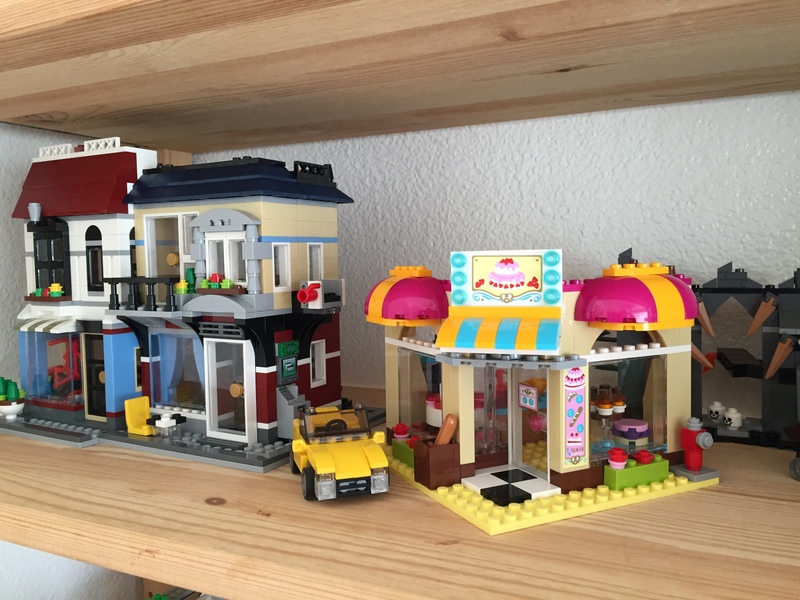 The cakes, pastries, platters, and details are awesome, and it sort-of fits in with the start of my Lego town street (ignore the orc attack in the background). The Friend-figs, I’m less thrilled about, they will probably end up in a bin, and their hair will likely be re-homed onto the regular minifigs.